Almost two centuries after Charles Darwin set sail on the Beagle, designers Jennifer and Mark Berlinger transformed their family's own voyage of discovery into a work of art. Fascinated with the connection between ancient fossils they discovered on the beach and the living creatures of today, they began to research the vast family of life on earth. That journey led them to the creation of this colorful artwork, filled with the wonderful variety of nature, from insects to mammals and beyond. This version of the chart is designed with children in mind, simplifying the complexity of the animal kingdom's many divisions, and presenting the animals with a charming look that will be fun to learn and recognize. The high quality, hand signed giclée print made from an original watercolor painting by Jennifer is made individually on German etching paper, using rich, 200-year archival inks. It is available in a custom-mounted, walnut finished BonanzaWood® frame, accented with off-white archival mat board that is FSC-certified for environmentally responsible production. Made in Westtown, Pennsylvania. Jennifer Berlinger was inspired to create this art after her children found fossils while vacationing in England. Unable to find a "tree of life" that would help them understand what they had found and its place in earth's history, they decided to create their own. The summer day project turned into two years of research! Wanting to show the beauty of the science, they combined the family's interest in antique prints with Jennifer's background in graphic design and watercolors. This was a gift from my husband for Mother's Day. It hangs at the end of the foyer where everyone can see it. Most of our friends are Academics also, so the print is always fawned upon. I love it so much and I would look at it daily. Never would I have thought I'd own it! 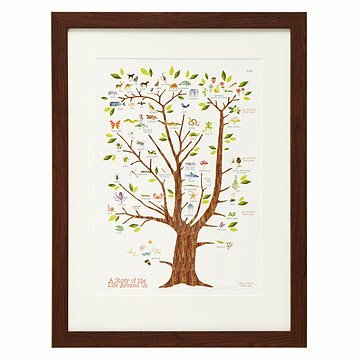 This beautifully illustrated chart of nature's family tree is designed to be engaging for children.